Very Vintage Fall Challenge Blog Hop. I decided to stay as close to the theme of "Very Vintage" as I could - especially since this is completely out of my realm of "Norm". means soooooo many different styles! creative side and release something new! Don't be surprised if you start seeing more 'Vintage Inspired' looks popping up on my site here and over in my Etsy store - this stuff is fun (interpretation: addicting!) and searching for oldies but goodies in antiques stores is something the hubby and I already love to do!! 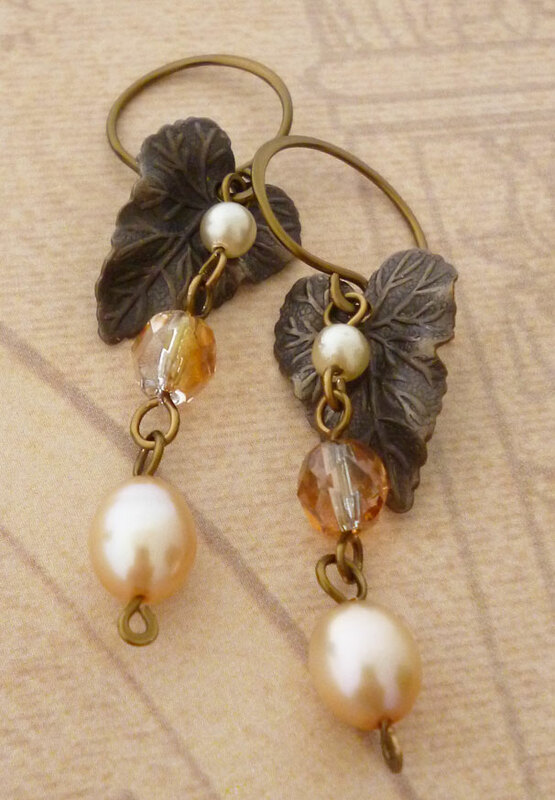 These gorgeous leaves that I just love from the Vintaj Natural Brass, Co. were in my kit, so I sat down and created these. Of course there's pearls in them, you all know me well enough by now to know I'd pop a pearl in somewhere, right?! If you look carefully, you'll see there's a pearl in everyone one of my designs here today! I couldn't figure out what to do with this Vintaj Natural Brass 'branch'. I've seen tons of these worked beautifully into so many designs over the past year, but nothing was speaking to me - until, I came up with this "Vintage Brooch". I even tried to hammer/texture the back pin portion so it would look a bit more 'tree like'. And, then there were still so many components staring at me, but I kept going back to this piece of "Candy". Well, it looks like a "Vintage" piece of candy to me! I love it but all I could think of was "Coffee". So, this is "Coffee with Cream, Please." A very simple and not so very vintage looking necklace, but vintage enough for me. I still have several other things from my kit on my bench that need to be made into something. Especially this one really cool lucite tear drop shaped component. I'm saving that for a more 'retro' piece! Thanks to Michelle Mack for hosting this lovely challenge. I'm glad I participated ~ I had a lot of fun! I hope everyone enjoys hopping through all the other particpants blogs and seeing the wonderful designs they've created. Don't forget to leave a nice comment for everyone, too! And, thanks so much for stopping here, too - I appreciate it! Peace, Love and "Falling For Vintage"! All of your designs are just beautiful, but that brooch is really something special! And the other error message says I don't have the authority to comment!??? But the hubby says the cookies are enabled (whatever that means) and this is where I really hate being techno-challenged and would gladly accept any bead challenge instead of the computer kind! So I apologize in advance if there's no comment on anyone's blog from me - but I have visited everyone and left comments on all who had their posts up! Oh, I know the struggles of being techno challenged! I asked the same question about cookies, and it was suggested that I totally log out of blogger, then log back in. It seemed to have helped. I think I'm just in love with the coffee with cream necklace. That is just so soft and pretty. The pin is such a great idea, I really love the pic of the back, I've never done one, so it helps to see the construction. Way to go girl! Shirley - thanks for the comments - your blog is one that it keeps having me post and then my comments just disappear - so not sure if I've let a zillion comments or none! I wanted to tell you that I love all your necklaces - and the colors are so amazing, but those earrings are some of my absolute favorites!! LOVE THOSE!! Thanks again for the nice comments!! Beautiful jewellery! Love that pin! And I don't think it's silly to texture the back. After all at least on other person will see it: the wearer/buyer. If the details are beautiful, they enhance the whole. And it makes it look like part of the design on the front. So I like the idea of texturing. It's a detail I'd love to see in my jewellery. Shel, the earrings are gorgeous...VERY vintage indeed...and the pin is just da bomb! Nice designs! Love the brooch! 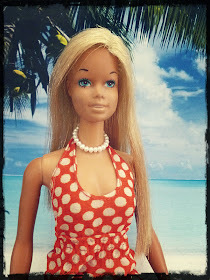 I also love the simple coffee necklace! Cool! All very lovely pieces! I especially like the earrings - so romantic! UMM Yes coffee & cream! Love the necklace and what an awesome pin! Your pin is beautiful and so clever! I love that you made it seem link the pin back was an organic part of the design. The first thing many customers do is to turn over a piece of jewelry, so it does make sense to make all sides of something beautiful if possible. 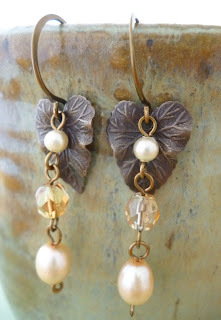 I love pearls, too--nice to see them in your vintage-inspired designs! Hope to see you in another challenge! All your pieces are beautiful, but the leaf earrings and the whimsical pin just look terrific! I like your style! I love the pin the most. I also wrapped wire around the branch, but I like how your vine looks natural, and loose. I must learn how to make a pin back with wire! Love what you did. Such a cool set of jewelry! I love the earrings, they're so sweet, and the pin is awesome! I love the earrings and the brooch, but I have to say that I am in love with the necklace. 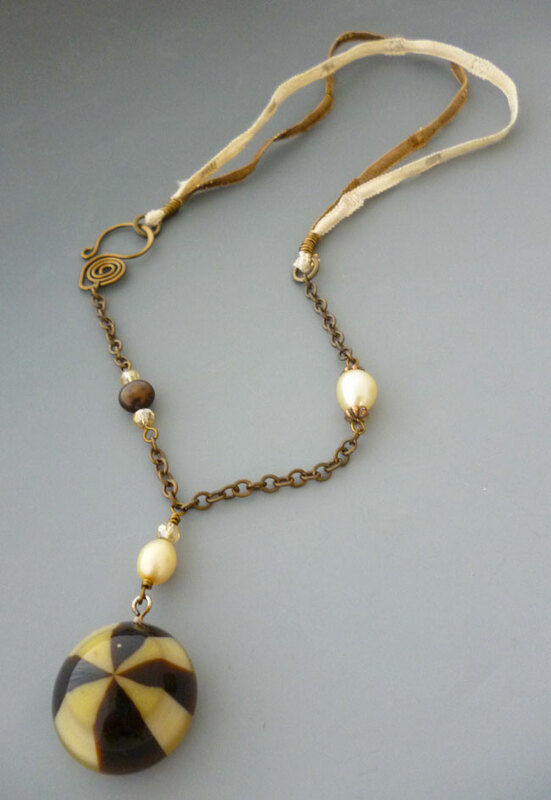 The mixed metals and fabric are lovely when mixed with the pendant. It really allows the pendant to be the star of the piece. Shel, the error only seems to happen on Blogger blogs. I found that if I view them and comment using Firefox, I don't have any problems. Now, on to your designs :) I LOVE that brooch!! So pretty, and says "FALL!" 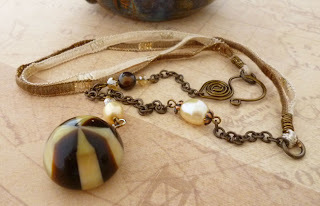 The coffee and cream necklace is adorable-the ribbon highlights the focal bead perfectly. 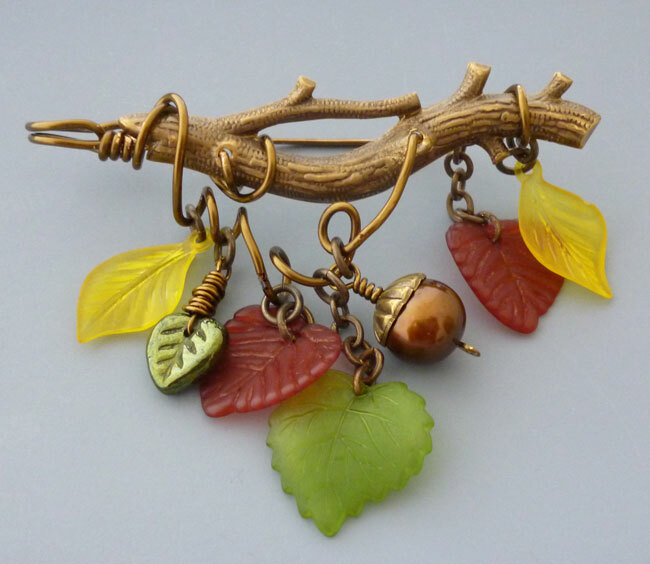 The vintage leaf earrings are so pretty! Beautiful work. Beautiful Work. I would wear the earrings and pin for sure. Your pendant on your necklace is perfect! I just realized I recently bought some of your findings from your Etsy store! I love them!! They are the best!! !Thanks again! Such gorgeous designs, all of them. Love the earrings especially. 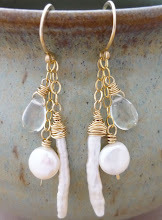 Cillaw - that's so cool - I'm so glad you like my findings/earring wires - that makes my day!! 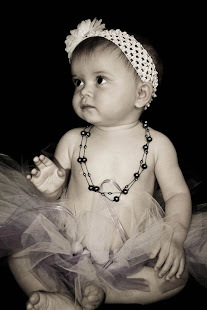 Love the brooch and pearls are my favorite. (Well, one of my favorites). All of the pieces look lovely! 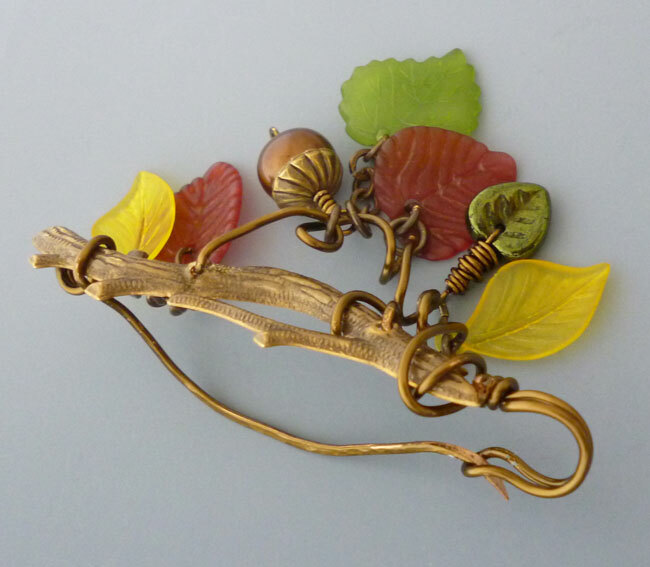 All of your pieces are lovely, but I'm really intrigued by the way you transformed that branch into a brooch. Super cool! !